This may be a little 'Monica' and is maybe a little much for some people but I've developed a weekly blogging schedule with a daily checklist. This means every post will definitely be tweeted/posted on facebook/linked to google+/added to an appropriate linky/sharing thread rather than me just tweeting a link or popping on facebook when I had a spare 5 minutes. I've numbered my posts of the week so I'm not always promoting the same post. 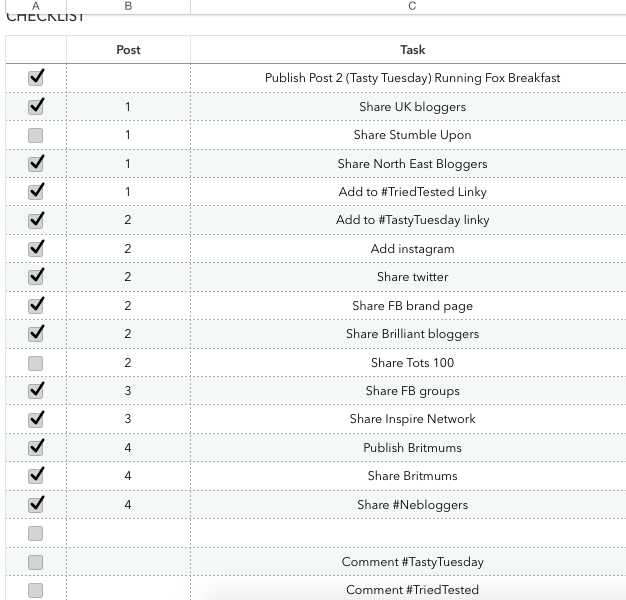 I'm not going to lie, it feels great to have taken control over my schedule like this and if you're serious about blogging, I would certainly recommend. I know a lot of bloggers schedule posts but I was NEVER that person. I would just type and post straight away. I have recently realised that as a reader, I know when to expect posts from my favourite blogs and that's what I would like to expect my readers to want too. So after much deliberation I have decided to post every Monday, Tuesday, Thursday and Friday plus my Weekend Reading post on a Sunday morning. I will schedule my posts to publish at around 6:30am every morning. I have been trialling scheduled posts for a few weeks now and it has been life changing! I love being able to quickly pop back and change something and I feel a lot less pressured to write when I have a weeks worth of posts already scheduled. My photographs are pretty well organised however I rarely re-name them. I am going to do this as soon as I download them from my camera onto my laptop - hopefully this will make them easier for me to find at a later date and will be better in terms of SEO when people search google images. Last year I was such a bad blogger! I rarely (if ever) replied to a blog comment and only really commented on blogs that were either in linkys or who I would consider a blogging friend. In all honesty I think this is quite rude of me and from the beginning of this year it has changed. I now schedule time in my diary to reply to every comment and have been reading and commenting on a lot more blogs than last year. I am really enjoying this and think it's always appreciated when you pop a comment on a post you've taken the time to read. I didn't really use twitter lists before now but changed at the start of this year and it has made my life so much easier! No more searching for a particular twitter handle - I just look on the relevant 'list' and it's there. I have a list for 'North East bloggers' and my monthly '#LoveNorthEast' linky so I can easily tweet people who have taken part. If you've never used this function on twitter before, I would highly recommend. What do you think? I'm hoping I can continue along the path I'm going and keep up with my daily checklist, scheduling posts and commenting. I would love to hear your tips too. Firstly thank you for the lovely words about me and Vicki, I don't think there is anything better in life than feeling something you do inspires someone else. Secondly I see a rosy year ahead for you if you keep to your goals here, I do schedule posts and it takes the pressure off *having to write* which always makes ideas flow. Labelling photos is well worth doing too and of course being social, it's the best part of being a blogger. Happy 2015 and I'm loving watching your blog grow. Thank you Fiona - I agree, it's lovely hearing you are an inspiration to people so always like to tell people when they are. I'd love to be this organised but it's never going to happen! I do attempt to publish the same time each week (I only manage 1 post a week) but am very random about promoting posts. 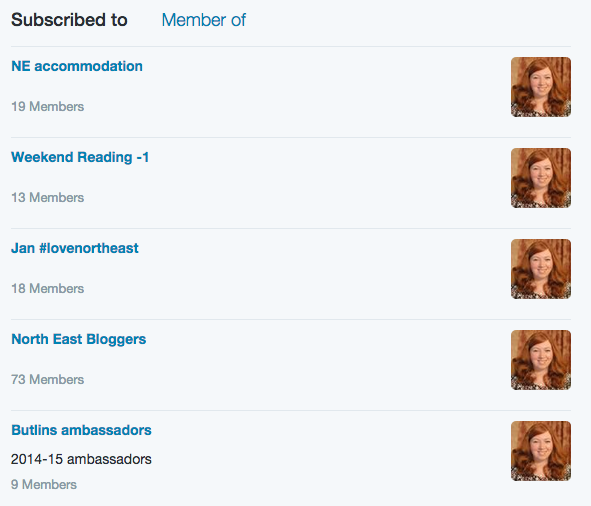 I have taken your inspiration though and am going to make an effort to use twitter lists. I love you for writing this - you've articulated everything I want to achieve! Checklists are my big thing right now thanks to a fab book I read called the Checklist Manifesto but I felt like perhaps a daily one would be too much but actually you're making it work! I'm going to try it. As for scheduling posts - it is my dream to have next weeks posts already written but I'm so hand to mouth it would basically result in no blogs this week! How did you make that transition from blogging as and when to doing this week AND next weeks posts?! Thanks Hannah - I used to have zero schedule to my blogging at all and over Christmas I slowed my 'publishing' down and although I wrote a the same pace I would schedule some of the posts instead of posting straight away. Eg when we stayed in wigwams I blogged about our stay and separately about breakfast - rather than publishing both straight away I scheduled the breakfast post for the following week. It did take a couple of weeks to finally get into sync. I am going to Hamsterley Forest tomorrow to take part in their Gruffalo trail - the old me would have written and published this as soon as I got home and linked to #countrykids linky. The new me already has a post lined up for tomorrow so I have a whole week to write and schedule The Gruffalo post for next week. I love my daily checklist - I have a tab for every day Mon-Sun and change the dates at the start of the week then an extra two tabs for 'week beginning....' where I plan my ideas for posts 2 weeks in advance. Working great so far. I always schedule posts helps me to be organised when blogging daily, also like to try and stay active on Twitter. Good luck with your blog, I know you'll do just fine! Definitely consistency - I have sometimes blogged three times in one day and then not again for a couple! Seems mad to think how badly organised I was! Well done for getting so organized, I really need to take note to the organizing and labelling of photos, I spend way too much time searching for the one I need. Mix of scheduled and spur of the moment sounds great - I'm not sure I could ever go back to spur of the moment now so if I ever have a tight deadline that might be challenging for me! Loving your list 'Monica' ;) I seriously need to sort myself a spreadsheet now! Love this post. Thanks for sharing. Must try and get better at this.